An Indiana Republican state lawmaker is under scrutiny after reportedly arranging to meet a young man online and allegedly exposing himself when the pair subsequently met in person, according to the Indianapolis Star. The Indianapolis Star reported that emails suggest Republican Rep. Phillip Hinkle arranged to pay Kameryn Gibson up to $140 for “for a really good time.” The paper published emails between Hinkle and Gibson detailing a plan for them to meet at a downtown Indianapolis hotel. The pair reportedly connected on Craigslist. Gibson indicated in a listing to which Hinkle responded that he is 20 years old. According to the Star, however, Gibson says he is actually just 18. Hinkle, who is 64 and was first elected in 2000, voted this spring for a constitutional gay marriage ban. 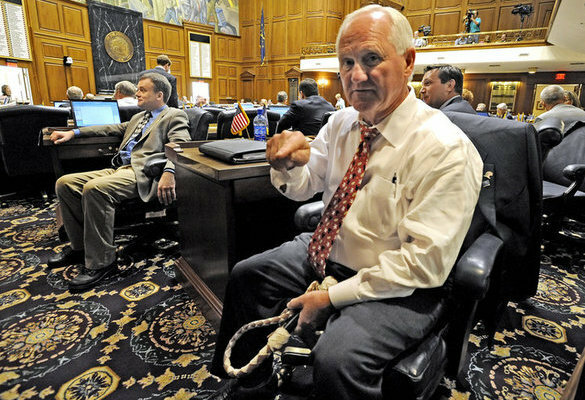 Several years ago he also was the House sponsor of the measure that created Indiana’s “In God We Trust” license plates. Lee, a 46-year old Republican and married father, resigned his Buffalo-area seat ... after the gossip website Gawker published e-mails he sent to a woman he met on Craigslist, including a photo where he is shirtless and flexing a biceps. Lee released a statement apologizing to his family and constituents for letting them down. Peter Nugent, an attorney for the Republican lawmaker, told the Associated Press that his client would not publicly discuss the accusations he faces and that a private investigation looking into the matter is underway. 9 Dead After Shooting At Historic Black Church in Charleston, S.C.